Background: Royal Jelly (RJ) has been verified to possess abundant pharmacological properties. RJ produced from special nectar blooms shows various functions. In this work, the immunomodulatory response of camellia RJ on a 4T1 murine breast cancer model is discussed. Methods: BALB/c female mice were divided into four groups. Group M was fed with water. Group RJ 0.5 and Group RJ 1.5 were treated with RJ (0.5, 1.5 g/kg body weight per day, respectively). Group CP was fed with water and injected intraperitoneally with cyclophosphamide (20 mg/kg body weight) every other day starting from the 8th day of tumour inoculation. The mice were kept for 42 days. The 4T1 tumour cell suspension was subcutaneously injected into the right mammary fat pads of each mouse, when the mice were administered orally on the 15th day. Results: Camellia RJ had no obvious effect on the levels of body weight in the 4T1-bearing mice, but it slightly inhibited growth of 4T1 breast cancer cells in vivo. The result shows that RJ (0.5 g/kg) had a significant immunomodulatory effect on the 4T1-bearing mice, which was reflected in serum by the augmentation of Tumour Necrosis Factor-Alpha (TNF-a), Immunoglobulin G (IgG) and the reduction of interleukin-6 (IL-6). At the same time, IL-10 production in spleen lymphocytes was also significantly reduced, which also reduced the Th2 response. And histopathological examinations with RJ were more effective. Conclusion: The results confirm that RJ can improve immunity in 4T1-bearing mice, and the effect of RJ on the mice immunity would be associated with its antitumor effect of RJ. Royal jelly (RJ), 4T1-bearing mice, Breast cancer, Immunomodulatory. As an emerging health problem, breast cancer is the most common cause of death in women. In spite of the presence of some acknowledged risk factors such as premature menarche, late menopause, nullipara, and positive family history, there is no suitable treatment for prime precautionary measure of breast cancer in individuals at the moment . A few studies have shown that immunomodulation of the host system could restrain the growth of tumours [2,3]. Changes in the immune response balance are an important defence against various diseases such as autoimmunity and cancer. A shortage of a suitable immune response could cause the progress of chronic inflammation, tumour growth and cancer . A procedure named ‘cancer immunosurveillance’ can help the immune system recognize and damage new-born tumour cells. This procedure is a considerable defence against tumour . Some studies have shown that mice can be protected by the immune system from different kinds of primary and transplantable tumours [5-7]. Both tumour development and tumour immunogenicity can be affected by the immune system. Royal Jelly (RJ) is a secretion produced by the hypopharyngeal and mandibular glands of worker honey bees (Apis mellifera) . There are a large number of bioactive components such as free amino acids, proteins, peptides, adenosine, fatty acids, minerals, and phenolic compounds in RJ . These days RJ is regarded as a good business prospect and employed in many industries including food manufacturing and the cosmetics industry. RJ has been verified to possess abundant pharmacological properties such as antioxidative , antiallergic , anti-inflammatory  and immunomodulatory properties . Some research studies have demonstrated that RJ could be antitumor . However, the effect of RJ on breast cancer has been rarely documented. The present study was designed to investigate the invasion effect of dietary supplementation with camellia RJ on the development of tumours and other organs of a 4T1 murine breast cancer model. A number of studies have shown that the 4T1 murine breast cancer model is an appropriate experimental animal model for human mammary cancer growth and metastasis in terms of immunogenicity, anatomically correct site and growth characteristics [15-17]. In this study the immunomodulatory effect of camellia RJ on this model was investigated. Fresh camellia RJ was attained from a local beekeeping association (Zhejiang, China), and stored under -20˚C. The content of moisture, ash, lipid, protein and 10-Hydroxy-2- Decenoic Acid (10-HDA) was determined as described by the method proposed by Garcia-Amoedo et al. . Acidity was tested by using the titration method, as shown by Serra- Bonvehi . The content of fructose, glucose and sucrose were analysed by liquid chromatography . Mouse mammary tumour cells (4T1) were purchased from the China Cell Culture Center. Cell culture was carried out under strict aseptic conditions. Cells were cultured in RPMI-1640 cell culture media (HyClone Co., Ltd, USA) and appended with 10% Foetal Bovine Serum (FBS, Gibco, USA) in a humidified environment provided with 5% CO2 at 37˚C. Female 4-week-old BALB/c mice were purchased from Shanghai SLAC Laboratory Animal Co., Ltd (Shanghai, China), and were ethically approved by the Animal Care and Use Committee (ACUC), Laboratory Animal Center of Fujian Medical University. Four mice were kept in a cage and raised under specific pathogen-free conditions with constant temperature and humidity and supplied with free access to autoclaved food and water. Before being used for the experiment, the mice were acclimatised for 1 week. 32 female BALB/c mice were randomly divided into 4 groups and there were 8 mice in each group. Group M was designed as 4T1-bearing model group and fed with water with no RJ content for 42 days. Group RJ 0.5 and Group RJ 1.5 animals were treated with RJ (0.5, 1.5 g/kg body weight per day, respectively)  for 42 days. Group CP was fed with water with no RJ content for 42 days, and injected intraperitoneally with cyclophosphamide (Jiangsu Hengrui Company, Jiangsu, China) at the dose of 20 mg/kg body weight every other day  starting from the 8th day of tumour inoculation. The body weight of each mouse was determined once a week during the entire experiment period. The 4T1 tumour cell suspension diluted by Phosphate Buffered Saline (PBS) was subcutaneously injected (0.2 ml, 4 × 105 cells/mouse) into the right mammary fat pads  of each mouse when the mice were administered orally on the 15th day. The tumour was detected palpably after one week of induction. The weight of each mice and the tumour size were measured periodically. The Volume (V) of the tumour was measured with a digital calliper every 4 days starting from 10th day of inoculation of tumour cells, and was calculated using the following formula : V (mm3)=(a × b2)/2, where a and b represented the maximum diameter and minimum diameter, respectively. After the mice had fasted 24 hours of the final intragastric administration, the eyeballs of all the animals were extracted for blood. The spleen lymphocytes were isolated as described previously , and improved. The progress was as follows: We collected the spleens from each group under aseptic conditions and immediately minced them into small pieces, then passed this through a 200 μm cell mesh to gain a single-cell suspension. After cell washing, we used a red blood cell lysis buffer to separate the lymphocytes from the erythrocytes. The splenic lymphocytes were then washed and re-suspended in a RPMI1640 medium, supplemented with 10% FBS. Cell viability (over 95%) was assessed microscopically by the trypan blue dye exclusion technique. The isolated spleen lymphocytes were re-suspended in RPMI-1640 and seeded in a 96-well culture plate at a concentration of 5 × 104 cells/well. The mitogen, Concanavalin A (Con A, Sigma, USA), was added at a final concentration of 5 μg/ml. After incubation for 18 h (37˚C, 5% CO2) , the cell-free supernatant was collected and kept at -80˚C for Enzyme-Linked Immunosorbent Assay (ELISA) experiments. Using ELISA kits (Excel Biotech (Taicang) Co., Ltd) according to the manufacturer’s protocols, we assayed the supernatants for concentrations of IL-10 and Tumour Necrosis Factor-alpha (TNF-a). After the sacrifice of the mice, necropsy was performed by immediately removing spleen, tumour, kidney, heart, lung, and liver out of the bodies of the mice. These organs were weighted with one over ten-thousand analytical balance. The liver for histological evaluation were excised and fixed in 10% buffered formalin for 24 h at room temperature. These tissue samples were then embedded in paraffin, sectioned longitudinally at 5 μm, and stained with Hematoxylin and Eosin (H and E) . Stained sections were inspected and photographed using a standard light microscope. The blood samples of mice in each group were centrifuged for 10 minutes at 3,000 X g . After this the serum was equally distributed and stored at -80˚C before cytokines assessment. Again using the commercial ELISA kits according to manufacturer’s instructions, we examined the serum samples for concentrations of various cytokines such as TNF-a, Interleukin (IL)-6 and IL-10. The effect of RJ on immunoglobulin markers was tested by measuring the activities of IgA (Excel Biotech (Taicang) Co., Ltd) and IgG (Bethyl Laboratories, Inc.) in serum using ELISA assay kits. All data were showed as mean ± SEM for this study. Statistical analysis was performed using one-way Analysis Of Variance (ANOVA) and Turkey’s post Hoc test to compare the control and investigation groups with statistical software package SPSS 17. A value of statistical significance was taken as being p<0.05. The results were expressed as means of three replications. All the indexes of fresh camellia RJ shown in Table 1 were similar to the conditions described by Sabatini et al. . It is worth mentioning that the content of 10-HDA (1.62%) was not very high compared with the height of 10-HDA content (3.39%) . Table 1: The main quality factors of camellia Royal Jelly. The change of mice body weight during treatment periods. The breast tumour model was adopted to study the effect of RJ on breast tumour growth and metastasis. It can be found from ** that no significant body weight loss occurred in the mice in the RJ-treated groups as shown in Table 2 relating to the M group during the experiment period. However, the Western chemotherapeutic medication cyclophosphamide notably reduced the body weight of the mice on the 35th and 42nd days, showing that cyclophosphamide would be harmful to mice. As shown in Figure 1, cyclophosphamide strongly inhibited tumour growth and the burden of 4T1 tumours in female BALB/c mice. RJ groups inhibited the development of tumour volume, but no significant differences compared with the M group on the 15th and 20th day after inoculation of the tumour cell was found. On the 25th and 28th days after inoculation of the tumour cell, there were significant differences between RJ groups and the M group. Though the development of the tumour was inhibited in the RJ groups, the inhibition effect was not as strong as it was in the CP group. There was no significant change on the mean weights of kidney and heart of the mice among all experimental groups, as shown in Figure 2. The mean weights of liver, lung, spleen and tumour of the CP group were decreased dramatically when compared with those of the M group, showing again that cyclophosphamide would be harmful to mice. 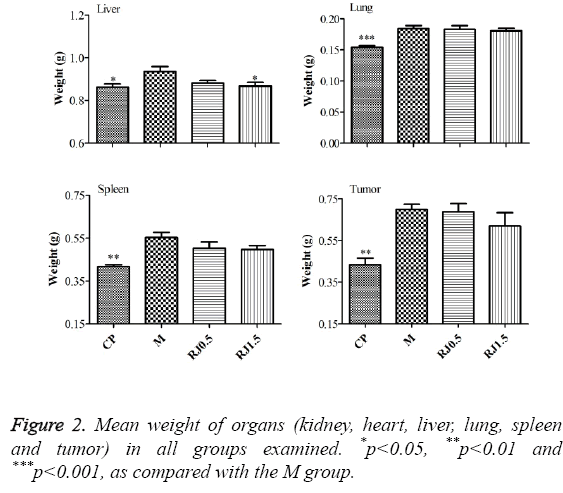 For groups treated with RJ, the mean weights of spleen and tumour were slightly decreased in relation to the M group. Table 2: The change of mice body weight (g) during treatment periods. 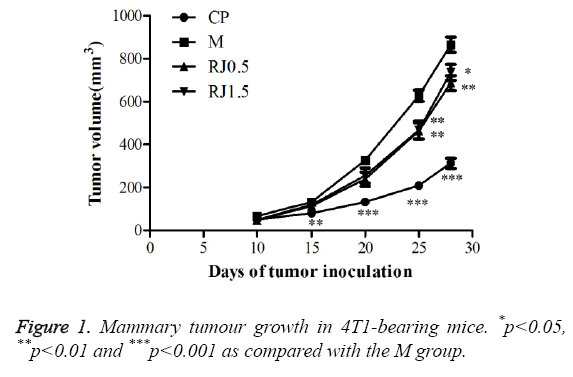 Figure 1: Mammary tumour growth in 4T1-bearing mice. *p<0.05, **p<0.01 and ***p<0.001 as compared with the M group. Figure 2: Mean weight of organs (kidney, heart, liver, lung, spleen and tumor) in all groups examined. *p<0.05, **p<0.01 and ***p<0.001, as compared with the M group. In order to investigate the immunomodulatory effects of RJ on breast-tumour-bearing mice, spleen lymphocytes were isolated from 4T1-bearing mice experimented on and cultured in vitro. As shown in Figure 3, the cytokines production and IL-10 from splenic lymphocytes were lower in the CP group and RJ 0.5 group when being compared with the M group while there was no such effect in groups of animals with the administration of RJ at the dose of 1.5 g/kg. No obvious change was observed in TNF-a among all experimental groups. Figure 3: Cytokines productions of mouse splenic lymphocytes. *p<0.05, **p<0.01 and ***p<0.001, as compared with the M group. To estimate metastasis, the liver from tumour-bearing mice was excised. Figure 4 shows the representative histological sections of livers from different groups. All sections of liver inspected displayed no obvious metastatic lesions. They were characterised by diffuse infiltration of a lot of inflammatory cells for the RJ groups and the M group. The tissues of the group CP were organized into lobules, with a central vein in the middle. Some hepatic strands in the M group were dissociated. Microscopic examination of the liver sections taken from mice treated with RJ showed the hepatic cords were less severe effects of 4T1 tumour on the hepatic tissues than that in the M group. 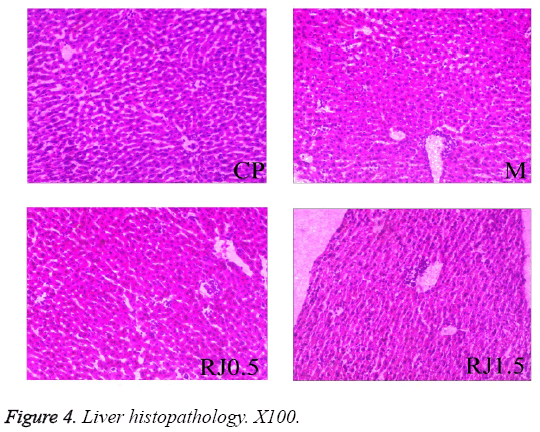 Figure 4: Liver histopathology. X100. 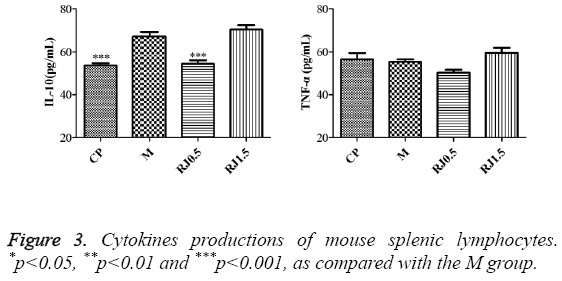 The CP did significantly modify the productions of all examined cytokines (TNF-a, IL-6 and IL-10) in serum of tumour-bearing mice, as illustrated in Figure 5. In the CP group, the production of TNF-a was significantly augmented and the production of IL-6 and IL-10 was down regulated in relation to the M group. The RJ 0.5 group treated with a lower concentration of RJ produced a higher level of TNF-a and a lower level of IL-6. In contrast, the level of IL-10 in serum was not significantly changed. The results suggested that RJ at the dose of 0.5 g/kg was effective in improving TNF-a/IL-6 ratio in serum to 4T1-bearing mice. The RJ 1.5 group treated with a higher concentration of RJ only produced a lower level of IL-6 when compared with the M group, while the level of TNF-a and IL-10 in serum was not drastically changed. Figure 5: Mean level of serum’s cytokines productions. *p<0.05, **p<0.01 and ***p<0.001, as compared with the M group. The results for IgG and IgA production in serum are shown in Figure 6. For IgG, analysis showed no significant increase in the CP and M groups. On the contrary, significant increases of this immunoglobulin were seen in the RJ 0.5 and RJ 1.5 groups. IgA production analysis showed that the CP group presented a significantly lower level than the M group, while there were no significant differences observed between the M group and the RJ groups. Figure 6: IgG and IgA level in serum of 4T1-bearing mice. *p<0.05, **p<0.01 and ***p<0.001, as compared with the M group. RJ has been proved to be a kind of potent pharmacological material proved in various animal types [26-28]. The composition of RJ is variable and dependent on seasonal and regional conditions  such as plants, and the function of RJ from different sources may be different. In this study, the antitumor activity and immunomodulatory effects of camellia RJ on 4T1-bearing BALB/c mice was evaluated. The results of this research indicated that cyclophosphamide, as a chemotherapy agent, can successful in inhibit the growth of the tumour. However, cyclophosphamide also has some side effects such as body; lung and liver weight loss as shown in Figure 2. Even IgA production was lower as shown in Figure 6. Cisplatin, a broad spectrum of antitumor activity, is similar to cyclophosphamide, which is limited by its side effects. Some studies showed the protective effect of RJ on both renal damage  and testis damage  induced by cisplatin. On the contrary, the doses of RJ solution used in this study were atoxic to the mice, as no anomalous variation in weight or behaviours of mice was observed. The effect of cyclophosphamide synchronously with RJ on the 4T1-bearing mice is worthy of further research. The volume of tumour in RJ groups was markedly smaller than that in the M group on the 25th and 28th day after tumour inoculation. The weight of tumour in the RJ groups was slightly reduced compared with the M group, but the difference was not statistically significant. Some studies have showed that 10- HDA plays a key role in the antitumor effect of RJ [31,32]. 10- HDA, a distinctive component of RJ , was considered to be present only in RJ . The content of 10-HDA was a variable amount of fresh RJ from 1.58% to 3.39% in seven RJ samples . The content of 10-HDA in the camellia RJ employed in this study was as low as 1.62% as shown in Table 1. Therefore, more research is needed to test the effect of RJ containing higher 10-HDA content on the tumour growth of 4T1-bearing mouse. Several investigators have reported that lymphocyte is a crucial event in the activation cascade of both cellular and humoral immune responses . IL-10, the expression of which reduces immune responses , has been relevant to cancer associatedimmunosuppression . Also, TNF-α has been known as a significant host defence cytokine that affects tumour cells . To further investigate the immune effects of RJ in mice inoculated with 4T1 cells, the ELISA method was applied to analyse the expression of IL-10 and TNF-a of spleen lymphocyte in 4T1 tumour-bearing mice. Similar to the innate inflammatory cytokines observed earlier in this study, the production of IL-10 in RJ`0.5 and CP groups was notably reduced. The level of TNF-a was no significant difference between RJ 1.5 and M group. However, the production of TNF-a in the RJ1.5 group was slightly higher than that of the M group. TNF-a could be involved in the development of breast tumour in 4T1-bearing mice. These data indicated that RJ had a beneficial effect on strengthening immunological response in 4T1 tumour-bearing mice. There was no apparent change in the tumour metastasis in the liver with RJ treatment. This result was in line with Orsolic et al. , who suggested that RJ given intraperitoneally or subcutaneously did not affect the formation of metastases in vivo. Figure 4 showed that the hepatic cords of the liver sections taken from mice treated with RJ were more clearly than that in the M group. The results suggested that RJ was effective to protect the liver of 4T1- bearing mice. It has been reported by Abdelhafiz et al. , Taghizadeh et al. and Yildirim et al. that RJ can protect the liver. Results of other studies have shown that pro-inflammatory cytokines, such as IL-1, IL-6 and TNF-a, played a key role in the pathogenesis of depression in patients . Inflammatory cytokines containing TNF-a and IL-6 were associated with breast cancer development . The amount of cytokine TNFa was related to antitumor activity , and was considered a key player in the cytokine web and a major intercessor of cancer-related inflammation . In serum, the results of this research displayed significantly elevated levels of TNF-a in CP and RJ 0.5 groups of 4T1-bearing mice compared with the M group. These results were consistent with Simuth et al. , who also showed an increased release of TNF-a after administration of RJ to mouse macrophages. RJ also increased the serum level of TNF-a in 2,4,6-Trinitrobenzene Sulfonic Acid (TNBS)-induced colitis in rats . IL-6 was a multipurpose cytokine which took part in acute inflammation as the major inducer of C-reactive protein, played an important role in haematopoiesis and augmented the proliferation of breast cancer cells . Results of other studies have also shown that carcinoma cells can accelerate the development of tumour and increase the level of IL-6 in serum . The unquestionable effect of reduced IL-6 concentrations displayed in CP and RJ groups of animals confirmed that RJ is a cytokine inducer. The lower level of IL-6 induced by RJ was found to contribute to tumour growth inhibition. As reported in a previous study, IL-10 inhibited cytokine production and deactivated macrophages, thus preventing or reducing the detrimental effects of excessive macrophage activation during inflammation , while the secretion of IL-10 was not significantly influenced by RJ in this study. The results concerning the effect of RJ on the IL-10 level in serum were in line with the studies of other authors, which also suggested that RJ had no influence on IL-10 yield by LPS/IFN-r-stimulated peritoneal macrophages . Parous women and patients with good prognosis had higher levels of serum IgG, as compared with nulliparous women and patients with poor prognosis . In the present study the groups supplemented with RJ showed a significant increase of IgG compared with the M group. In the CP group no dramatic alterations were found. This factor might partially elucidate the results found in elevated immunoglobulin IgG levels of 4T1- bearing mice associated with the supply in the diet of RJ. The IgA increase mirrored the load and activity of the cancerous cells through host immunomodulation or exudation of IgA by their own cells . However, RJ had no influence on the immunoglobulin IgA level. The data of these studies demonstrated that the antitumor effect of camellia RJ was weaker compared with CP. Camellia RJ could activate spleen lymphocytes and its cytokine expression. The weak antitumor effect of RJ might be closely related to elevating serum immune modulation and splenic lymphocytes' activity. Similar with our previous research results (accepted by Tumour Letters), RJ improved the immunity of 4T1-bearing mice. These studies suggest that it is worth investigating the potential benefits to 4T1-bearing mice by using CP combined with RJ. This research was supported by earmarked funds provided by the Finance Department of Fujian province [K81MLV02A] and the Modern Agro-industry Technology Research System (No. CARS-45-KXJ3). van Diest PJ, van der Wall E, Baak JP. Prognostic value of proliferation in invasive breast cancer: a review. J ClinPathol 2004; 57: 675-681. Murugaiyan G, Saha B. IL-27 in tumor immunity and immunotherapy. Trends Mol Med 2013; 19: 108-116. Vesely MD, Kershaw MH, Schreiber RD, Smyth MJ. Natural innate and adaptive immunity to cancer. Annu Rev Immunol 2011; 29: 235-271. Jorsaraei SG, Maliji G, Azadmehr A, Moghadamnia AA, Faraji AA. Immunotoxicity effects of carbaryl in vivo and in vitro. Environ ToxicolPharmacol 2014; 38: 838-844. Shankaran V, Ikeda H, Bruce AT, White JM, Swanson PE, Old LJ, Schreiber RD. IFN and lymphocytes prevent primary tumour development and shape tumour immunogenicity. Nature 2001; 410: 1107-1111. Smyth MJ, Thia KY, Street SE, MacGregor D, Godfrey DI, Trapani JA. Perforin-mediated cytotoxicity is critical for surveillance of spontaneous lymphoma. J Exp Med 2000; 192: 755-760. Street SE, Trapani JA, MacGregor D, Smyth MJ. Suppression of lymphoma and epithelial malignancies effected by interferon gamma. J Exp Med 2002; 196: 129-134. Takahama H, Shimazu T. Food-induced anaphylaxis caused by ingestion of royal jelly. J Dermatol 2006; 33: 424-426. Ramadan MF, Al-Ghamdi A. Bioactive compounds and health-promoting properties of royal jelly: A review. J Funct Foods 2012; 4: 39-52. Delkhoshe-Kasmaie F, Malekinejad H, Khoramjouy M, Rezaei-Golmisheh A, Janbaze-Acyabar H. Royal jelly protects from taxol-induced testicular damages via improvement of antioxidant status and up-regulation of E2f1. SystBiolReprod Med 2013; 60: 80-88. Okamoto I, Taniguchi Y, Kunikata T, Kohno K, Iwaki K, Ikeda M, Kurimoto M. Major royal jelly protein 3 modulates immune responses in vitro and in vivo. Life Sci 2003; 73: 2029-2045. Yanagita M, Kojima Y, Mori K, Yamada S, Murakami S. Osteoinductive and anti-inflammatory effect of royal jelly on periodontal ligament cells. Biomed Res 2011; 32: 285-291. Kai H, Motomura Y, Saito S, Hashimoto K, Tatefuji T, Takamune N. Royal jelly enhances antigen-specific mucosal IgA response. Food SciNutr 2013; 1: 222-227. Tamura T, Fujii A, Kuboyama N. Antitumor effects of Royal Jelly (RJ). Nihon YakurigakuZasshi 1987; 89: 73-80. Pulaski BA, Ostrand-Rosenberg S. Reduction of established spontaneous mammary carcinoma metastases following immunotherapy with major histocompatibility complex class II and B7, 1 cell-based tumour vaccines. Cancer Res 1998; 58: 1486-1493. Taavoni S, Barkhordari F, Goushegir A, Haghani H. Effect of royal jelly on premenstrual syndrome among Iranian medical sciences students: a randomized, triple-blind, placebo-controlled study. Complement Ther Med 2014; 22: 601-606. Luo KW, Ko CH, Yue GGL, Lee JKM, Li KK, Lee M, Li G, Fung KP, Leung PC, Lau CBS. Green tea (Camellia sinensis) extract inhibits both the metastasis and osteolytic components of mammary cancer 4T1 lesions in mice. J NutrBiochem 2014; 25: 395-403. Garcia-Amoedo LH, Almeida-Muradian LBD. Physicochemical composition of pure and adulterated royal jelly. Quimica Nova 2007; 30: 257-259. Serra Bonvehi J. Acidity and pH of royal jelly. An Food technol Spanish Soc Food Sci 1992; 44: 65-69. Sesta G. Determination of sugars in royal jelly by HPLC. Apidologie 2006; 37: 84-90. Bincoletto C, Eberlin S, Figueiredo CA, Luengo MB, Queiroz ML. Effects produced by royal jelly on haematopoiesis: relation with host resistance against Ehrlich ascites tumour challenge. IntImmunopharmacol 2005; 5: 679-688. Lin G, Yu X, Wang J, Qu S, Sui D. Beneficial effects of 20 (S)-protopanaxadiol on antitumor activity and toxicity of cyclophosphamide in tumour-bearing mice. ExpTher Med 2013; 5: 443-447. Li C, Wu X, Zhang H, Yang G, Hao M, Sheng S, Sun Y, Jiang Long J, Hu C, Sun X, Li L, Zheng J. A huaier polysaccharide inhibits hepatocellular carcinoma growth and metastasis. Tumor Bio 2015; 36: 1739-1745. Luo KW, Yue GGL, Ko CH, Lee JKM, Gao S, Li LF, li G, Fung KP, Leung PC, Lau CBS. In vivo and in vitro anti-tumor and anti-metastasis effects of Coriolusversicolor aqueous extract on mouse mammary 4T1 carcinoma. Phytomed 2014; 21: 1078-1087. Sabatini AG, Marcazzan GL, Caboni MF, Bogdanov S, Almeida ML. Quality and standardisation of royal jelly. J ApiProdApi Med Sci 2009; 1: 1-6. Barnutiu LI, Marghitas LA, Dezmirean DS, Mihai CM, Bobis O. Chemical composition and antimicrobial activity of royal jelly-review. Sci Pap SciBiotechnol 2011; 44: 67-72. Tokunaga K, Suzuki KM, Yoshida C, Maruyama H, Futamura Y, Araki Y, Mishima S. Antihypertensive mechanism of royal jelly treated with protease in spontaneously hypertensive rats. Soc Food SciTechnol 2004; 51: 34-37. Manzo LP, de-Faria FM, Dunder RJ, Rabelo-Socca EA, Consonni SR.Royal jelly and its dual role in TNBS colitis in mice. Sci World J 2015; 2015: 956235. Yapar K, Cavusoglu K, Oruc E, Yalcin E. Protective effect of royal jelly and green tea extracts effect against cisplatin-induced nephrotoxicity in mice: a comparative study. J Med Food 2009; 12: 1136-1142. Silici S, Ekmekcioglu O, Eraslan G, Demirtas A. Antioxidative effect of royal jelly in cisplatin-induced testes damage. Urol 2009; 74: 545-551. Townsend GF, Morgan JF, Hazlett B. Activity of 10-hydroxydecenoic acid from royal jelly against experimental leukaemia and ascitic tumours 1959. Townsend GF, Morgan JF, Tolnai S, Hazlett B, Morton HJ, Shuel R. Studies on the in vitro antitumor activity of fatty acids I. 10-hydroxy-2-decenoic acid from royal jelly. Cancer Res 1960; 20: 503-510. Terada Y, Narukawa M, Watanabe T. Specific hydroxy fatty acids in royal jelly activate TRPA1. J Agric Food Chem 2011; 59: 2627-2635. Isidorov V, Czyzewska U, Isidorova A, Bakier S. Gas chromatographic and mass spectrometric characterization of the organic acids extracted from some preparations containing lyophilized royal jelly. J Chromatogr B 2009; 877: 3776-3780. Singh SS, Haldar C, Rai S. Melatonin and differential effect of L-thyroxine on immune system of Indian tropical bird Perdiculaasiatica. Gen Comp Endocrinol 2006; 145: 215-221. Coico RG. Immunology: A Short Course. John Wiley Sons Inc., New Jersey, USA (7thedn.) 2003. Khong HT, Restifo NP. Natural selection of tumour variants in the generation of tumor escapes phenotypes. Nat Immunol 2002; 3: 999-1005. Zhang W, Li J, Qiu S, Chen J, Zheng Y. Effects of the Exopolysaccharide Fraction (EPSF) from a cultivated Cordycepssinensison immunocytes of H22 tumour bearing mice. Fitoterapia 2008; 79: 168-173. Orsolic N, Terzic S, Sver L, Basic I. Honey-bee products in prevention and/or therapy of murine transplantable tumours. J Sci Food Agric 2005; 85: 363-370. Abdelhafiz HA, El-kott AF, Elesh MR. Hepatoprotective effect of royal jelly against cisplatin-induced biochemical, oxidative stress, anti-oxidants and histopathological abnormalities. Adv Life SciTechnol 2014; 27: 28-38. Taghizadeh S, Nejati V, NajafiG. Protective effect of oral administration of royal jelly on liver damage induced by chronic immobilization stress in adult male mice. J MazandaranUni Med Sci2014; 24: 140-149. Yildirim S, Karadeniz A, Karakoc A, Yildirim A, Kalkan Y, Simsek N. Effects of royal jelly on liver paraoxonase activity in rats treated with cisplatin. Turk J Med Sci 2012; 42: 367-375. Leonard B, Maes M. Mechanistic explanations how cell-mediated immune activation, inflammation and oxidative and nitrosative stress pathways and their sequels and concomitants play a role in the pathophysiology of unipolar depression. NeurosciBiobehav Rev 2012; 36: 764-785. Lithgow D, Covington C. Chronic inflammation and breast pathology: a theoretical model. Biol Res Nurs 2005; 7: 118-129. Zhang J, Wang G, Li H, Zhuang C, Mizuno T, Ito H, Mayuzumi H, Okamoto H, Li J. Antitumor active protein-containing glycans from the Chinese mushroom songshanlingzhi, Ganodermatsugae mycelium. BiosciBiotechnolBiochem 1994; 58: 1202-1205. Kamel M, Shouman S, El-Merzebany M, Kilic G, Veenstra T, Saeed M, Wagih M, Diaz-Arrastia C, Patel D, Salama S. Effect of tumour necrosis factor-alpha on estrogen metabolic pathways in breast cancer cells. J Cancer 2012; 3: 310-321. Simuth J, Bilikova K, Kovacova E, Kuzmova Z, Schroder W. Immunochemical approach to detection of adulteration in honey: physiologically active royal jelly protein stimulating TNF-a release is a regular component of honey. J Agric Food Chem 2004; 52: 2154-2158. Karaca T, Uz YH, Demirtas S, Karaboga I, Can G. Protective effect of royal jelly in 2,4,6 trinitrobenzene sulfonic acid-induced colitis in rats. Iran J Basic Med Sci 2015; 18: 370-379. Sullivan NJ. Interleukin-6 as a potential mediator of breast cancer progression and non-melanoma skin carcinogenesis.Ohio S Uni 2009. Alokail MS, Al-Daghri NM, Mohammed AK, Vanhoutte P, Alenad A. Increased TNF-a, IL-6 and ErbB2 mRNA expression in peripheral blood leukocytes from breast cancer patients. Med Oncol 2014; 31: 1-6. Williams LM, Ricchetti G, Sarma U, Smallie T, Foxwell BM. Interleukin-10 suppression of myeloid cell activation--a continuing puzzle. Immunology 2004; 113: 281-292. Kohno K, Okamoto I, Sano O, Arai N, Iwaki K, Ikeda M, Kurimoto, M. Royal jelly inhibits the production of pro-inflammatory cytokines by activated macrophages. Bios BiotechnolBiochem 2004; 68: 138-145. Papatestas AE, Bramis J, Aufses AH Jr. Serum immunoglobulins in women with breast cancer. J SurgOncol 1979; 12: 155-163. Mahdi NK, Al-Jowher MH, Ali HQ. Can IgA, C3, IL-6 and TNF-I± act as predictors for reoccurrence of breast cancer among Iraqi women. Qatar Med J 2013; 2013: 30-31.